Professor Bernstein has been training and teaching martial arts for over 20 years. He holds a 4th degree black belt in Kenpo Karate, a 2nd degree black belt in Kajukenbo, a black belt in Gracie Jiu Jitsu under Master Royler Gracie and Professor David Adiv. He also has extensive training in Kickboxing, Eskrima, Wushu, Tai Chi and Capoiera. He has been focusing on his Jiu Jitsu training under the close guidance of Professor David Adiv and Master Royler Gracie. 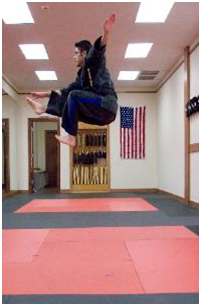 Allan's dedication to Martial Arts training is surpassed only by his dedication to his students. Professor Bernstein began teaching martial arts as early as 15 years old, not only teaching children but adults as well. He is often described as the most detail oriented instructor you will ever train with. Parents' of Professor Bernstein's Students are continually impressed by his ability to teach children how to set and achieve goals, focus on the task at hand and of course self-discipline. Royler Gracie was born in Rio de Janeiro, Brazil. He is the fifth son of Grandmaster Helio Gracie. He started Jiu-Jitsu at the age of three and has been competing as a Black Belt for more than twenty years. During his career, he has had more than 300 matches and has won the World Championships four years running, Abu Dhabi (ADCC) championship three years running and several national and regional titles. He has been one of the most active Jiu-Jitsu competitors in history. Royler is always ready to test himself against people of all sizes and therefore holds many different titles. David Adiv was born and raised in Israel and his love for the Martial Arts developed early. He studied the art of Judo and excelled as a student, then a competitor, winning many international titles, and became a highly sought after Instructor. David would split his time spending six months in the USA and six months in Brazil studying and teaching Gracie Jiu-Jitsu. In 1995 his talent, hard work and abilities were recognized as he received the honor of being part of Royler Gracie’s training team, David had earned the honor of accompanying Royler and Rickson to Japan for Royler’s first Vale Tudo match. Ever since then, David has traveled the world as an integral part of Royler’s training team. His knowledge and technique have allowed him to also become part of Professor Royler Gracie’s creative team and he is featured along with Professor Royler Gracie in two of his bestselling books: “BJJ Submission Grappling” and ‘Gracie Jiu-Jitsu Submission Essentials” (with Grand Master Helio Gracie). All Professor Adiv’s experiences have helped him to develop into and be recognized by many as one of the most technical Black Belts in the world. He is able to teach all aspects of Gracie Jiu-Jitsu: Self-defense, Sport Jiu- Jitsu, Submission Grappling and Vale Tudo (NHB). David is also a highly sought after Instructor for Law Enforcement, the Military, Air Marshals and more. The RGDA Real Defensive Tactics System has been taught at Law Enforcement Departments at Federal, State and local levels.